Reflections (Oil Bar Painting as of July 30, 2013), a photo by randubnick on Flickr. This is my oil bar painting after I worked on it yesterday. (I am now behind by one day in my posts.) This scene is loosely based on a photo that I took at Bradley Palmer State Park. (The photo is posted here June 14.) 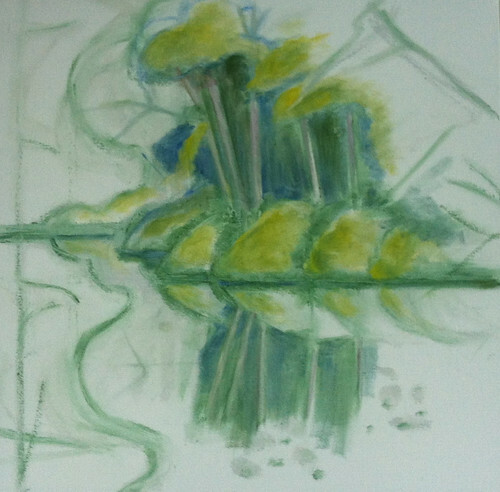 So yesterday, for the second day, I worked on the reflections in the water, trying to get the shapes right. I am still re-checking placement and modifying where things are. 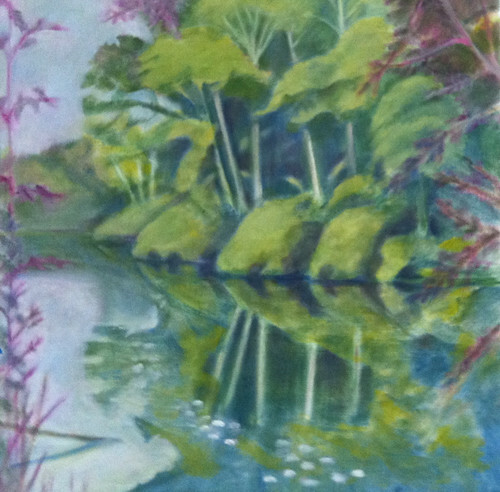 I also extended the shoreline foliage and reflections all the way to the right side of the canvas. Even though some of the shapes I am painting in on the right will be obscured in the end by the tree in the foreground, I need to understand what is there so that anything that shows through will make sense. I also started darkening the lower right part of the canvas, and at this point, I am glad I used pink to (temporarily) indicate tree branches in the foreground. Otherwise, it would be very easy to loose sight of them as the surrounding colors become darker. To be continued. . . .
Another Heart Shaped Box as of July 29, 2013, a photo by randubnick on Flickr. Reflections (Oil Bar Painting as of July 29, 2013), a photo by randubnick on Flickr. I working on this painting this morning, and here is how it looked when it was time to quit for the day. I am using oil bars to paint this landscape, loosely based on a photo that I took last summer at Bradley Palmer State Park (Topsfield, MA). The reference photo is posted here on June 14, 2013. Recently I made changes in the shapes along the shoreline, so today I worked on modifying the reflections so the shapes match. To do this, I turned the painting and the reference photo sidewise. First I adjusted the reflected shapes to come as close to a "mirror image" as I could. Then I adjusted the angle of the reflected shapes just a bit. In the photo, they angle back by a few degrees. I don't know why that is (refracted light? angle of the sun? moving water?) but I know what I see, so I am painting that in. I am happier with the shapes of the reflections, but I plan to adjust the color and texture because the shapes look too flat at the moment. I also added a little more blue to the shadows of the foliage and edge of the shoreline. Reflections (Oil Bar Painting as of July 28, 2013), a photo by randubnick on Flickr. This morning I worked on this oil bar painting, a scene based on a photo that I took at Bradley Palmer State Park (posted here June 14.) There are still a few placement issues to resolve, but I am getting there. Today I tried to figure out where the very darkest areas are. I painted them in with blue, and then purple, and then green. (Looking at this, I have decided to that I want to see more blue in the shadows, so I will put it back in tomorrow.) Then I tried to figure out where the brightest light is going to be. I also used a straight-edge to correct the shoreline in the distance. I see lots of things I want to correct. It will be hard to figure out where to start tomorrow. But I have a feeling that this painting is going to spend some on its side. . . . and perhaps even upside-down. Reflections (Oil Bar Painting as of July 27, 2013), a photo by randubnick on Flickr. This morning I worked on this oil bar painting, and this is how it looked when I stopped working. I am painting a scene at Bradley Palmer State Park, from a photo that I took last summer. (Reference photo posted June 14, 2013). 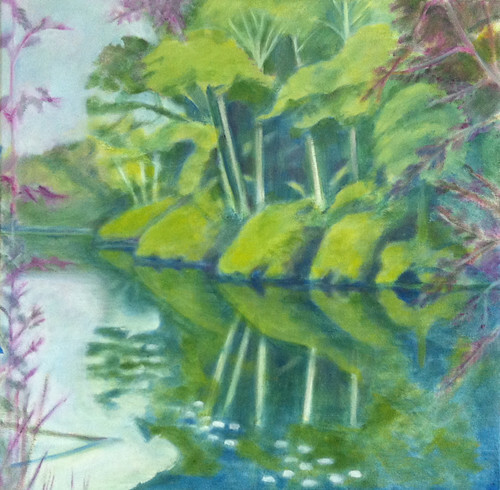 Today I went back to the shoreline and modified the shapes of the foliage along the water. I also made some changes to the trees, suggesting foliage in the shadows. 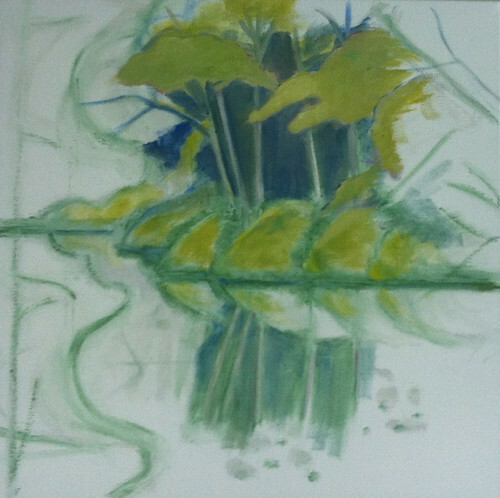 And I also worked a bit on placement of the lily pads in the foreground. This is still underpainting. This is still underpainting. I am still using very thin coats of paint while I figure out placement and composition. Reflections (Oil Bar Painting as of July 26, 2013), a photo by randubnick on Flickr. This morning I worked on my oil bar painting, a landscape based on a photo I took last summer at Bradley Palmer State Park here in Massachusetts. Today I concentrated on the tree on the left side of the canvas, still working out the placement of the branches. Now this tree doesn't appear in the reference photo that I posted here on June 14, but it does appear in the original version of the photo (posted on August 25, 2012.) That tree disappeared when I cropped the photo to get a square image. But I decided to put it back in, but in a slightly different place. That has been tricky, but now I think I am on the right track. This morning I figured out where I want the branches of that tree to go, making sure they don't obscure the view. 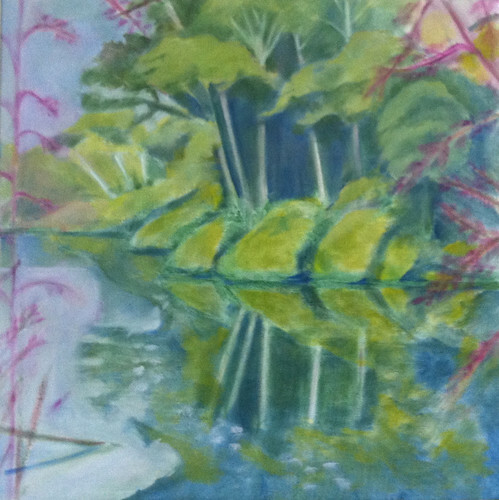 I also am trying to add foliage at the left side of the canvas, but am letting the view of river show through the leaves. I am still using pink to indicate trees in the foreground, just to make things easier to see while I am working out the composition, but they will be green in the final painting, and that will make them less prominent. To be continued. . . .
Reflections (Oil Bar Painting as of July 25, 2013), a photo by randubnick on Flickr. Here is my oil bar painting as it looked after I finished working on it on July 25. My reference for this scene is a photo that I took at Bradley Palmer State Park last summer, and it is posted here on June 14. I worked on the shapes in the distance (on the left), to show more open sky and clear water. I also worked on the foliage of the trees in the foreground. Reflections (Oil Bar Painting as of July 24, 2013), a photo by randubnick on Flickr. This morning I continued work on this oil bar painting, based on a photo that I took last summer at Bradley Palmer State Park (Topsfield, MA). If you want to see the photo, look for my post of June 14 on this site. Today I kept going with the trees in the foreground, and also managed to add a little more open sky. I think it is shaping up. Reflections (Oil Bar Painting as of July 23, 2013), a photo by randubnick on Flickr. This is my oil bar painting as it looked when I finished painting today. This landscape is based on a photo I took last summer at Bradley Palmer State Park in Topsfield, MA. (The reference photo is posted here, June 14.) Yesterday I worked on placement of the trees in the foreground on the right and left. Although I was happy with the tree on the right, the tree on the left bothered me because it seemed to be making the scene too crowded and I was losing the sense of space opening up in the distance. In yesterday's post I said that I had decided needed to either 1) paint out all of part of that tree, 2) move the tree over a bit more, or 3) moving the shoreline over just a bit to increase the sense of space. This morning I work up around 5:30 AM with a plan, so I decided to get up and paint. I moved the tree on the left closer to the edge of the canvas and pulled back on the foliage just a bit. I looked hard at the reference photo and the canvas, and realized that one of the problems is that second set of three trees in the distance wasn't lined up where it should be, so I moved it towards the center of the canvas. That was the key. Then I moved trees, foliage, and reflections on the left-hand side, scooting everything toward the center, to make more room for open sky and bright water. I began to feel like the space in the distance was opening up again, so I was very happy. I also did a little work on the tree on the right. Yesterday I used pink paint to indicate the trees and foliage in the foreground, just temporarily so I can see more clearly what goes where. But I thought that might be making the trees more prominent, and adding to the sense that the space was crowded. In the reference photo, the foliage of the trees in the foreground is dark green and blends in to the rest of the scene. So I added some green to the tree on the right, and watched as the foliage began to blend in to the rest of the scene. I only worked for about an hour, but I feel like it was time well spent, because I think this painting is back on track. Reflections (Oil Bar Painting as of July 22, 2013), a photo by randubnick on Flickr. This morning I worked my oil bar painting of a scene at Bradley Palmer State Park, from a photo I took there last summer. (The reference photo is posted here June 14th.) This morning I tried to work out placement of the trees in the foreground, on the left and right edges of the canvas. (This is not the final color; I used pink to indicate foreground trees so I can easily distinguish them from the trees that are further away.) So far I am happy with the placement of the tree on the right. But I am going to make changes with the tree on the left. I already moved it slightly closer to the edge of the canvas, but even so I feel like I am losing the feeling of space opening up in the distance. Options I am considering: 1) painting out all of part of that tree, 2) moving the tree over a bit more, or 3) moving the shoreline over just a bit to increase the sense of space. Or perhaps a little bit of all three. In any case, it is good to have time to think it over. Reflections (Oil Bar Painting as of July 21, 2013), a photo by randubnick on Flickr. First thing this morning, I worked for an hour on this oil bar painting. I am trying to capture a scene that I photographed last year at Bradley Palmer State Park in Topsfield, MA. (I am using my photo as a reference, and you can see it posted on June 14, 2013.) I am still working out placement and composition. Today I worked on the foliage of the main trees on the river bank, and worked out placement issues for the foliage and branches at the top of the canvas. To be continued. . . .
Reflections (Oil Bar Painting as of July 20, 2013), a photo by randubnick on Flickr. This is my oil bar painting in progress as it looked when I was finished working on it today. This painting is based on a photo that I took last summer at Bradley Palmer State Park. (My reference photo is posted here, June 14, 2013.) Most of the changes I made today are on the lefthand side of the canvas. 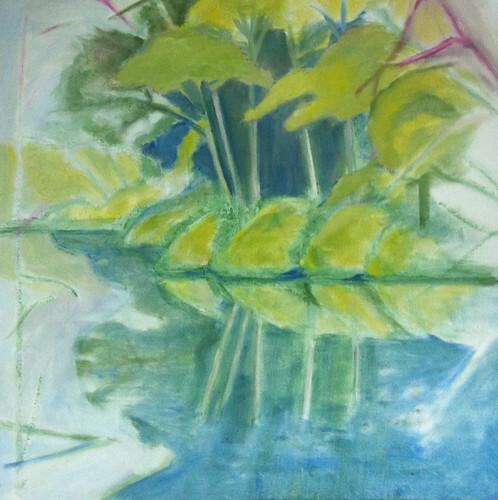 I revised the shapes of the shadows in the water as well as some of the shapes of the foliage, trying to get the reflections to make sense. I spent a lot of time looking at the reference photo, right-side-up and upside-down, and also turned the painting upside-down to paint some of the reflected shapes. I also added to the riverbank and trees in the background (also on the left). To be continued. . . .
Reflections (Oil Bar Painting as of July 19, a photo by randubnick on Flickr. I worked on this painting again this morning. I am using oil bars to paint this scene, loosely based on a photo that I took at Bradley Palmer State Park last summer. (The reference photo is posted here June 14.) This morning, I concentrated on the reflections of the trees in the water, especially the foliage. I began working right-side-up; then I turned the canvas and the reference image upside-down, and then right-side-up again. This is probably the hardest part of this painting. 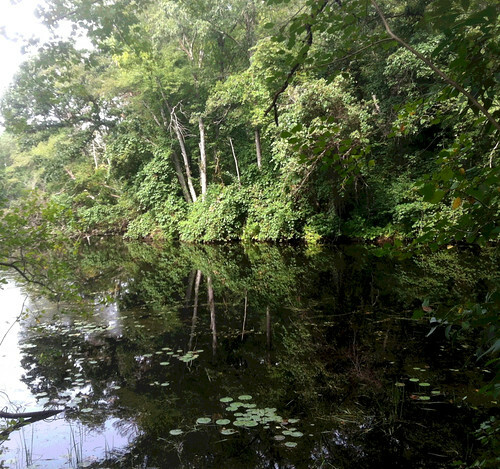 In the photograph, the reflected foliage is hard to see its color and value don't contrast very much with the dark water. So I took a sharpie to the photocopy of the reference photo and outlined the reflected foliage to help me understand. Then I went back to the canvas, and it was easier. Later I will darken the reflected foliage so it will be as subtle as in the photo, but at this point, I need to be able to see the shapes clearly. I also did work on placement of the trees in the foreground. Because I am already getting lost in these virtual woods, I used pink to indicate tree branches in the foreground, and gray to indicate branches on the trees across the water. I kind of like the way that looks, but these are not the final colors. To be continued. . . .
Reflections (Oil Bar Painting as of July 18, 2013), a photo by randubnick on Flickr. This morning I worked on this oil bar painting for about an hour. I am using one of my photos as a reference, taken last summer at Bradley Palmer State Park in Topsfield, MA. (The reference photo is posted here July 14, 2013.) 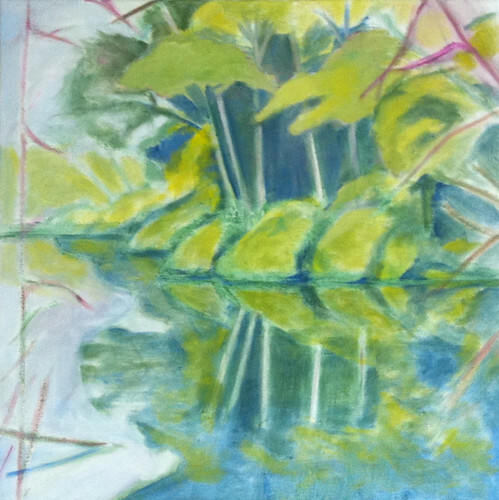 Yesterday I worked on the shapes and placement of the four central trees (and their reflections in the water), so this morning I built on that, working out placement and shapes of surrounding trees across the water. (I also worked out the placement of some of the tree branches in the foreground, but those are just sketched in at the moment.) I also roughed in some color to indicate sky and water. This is underpainting (first coat) and the colors are primarily to establish the composition, so they may change, along with the shapes. 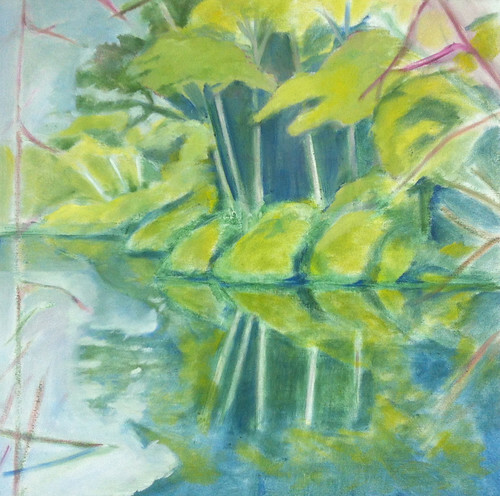 Reflections (Oil Bar Painting as of July 17, 2013), a photo by randubnick on Flickr.
. (The reference photo is posted here July 15.) This morning I continued to work on placement and composition. I started with the goal of correcting the placement of the foliage on the four main trees that are going to be the focus. I wanted to bring the foliage down because it looked like it was too high on the canvas. I was able to check because I had drawn a simple nine-cell grid on the printout of the photo, and had also marked off a matching nine-cell grid on the canvas (I used blue painter's tape on the side edges of the canvas). So I started moving things around, paying attention to negative shapes. I introduced new colors just to keep me from getting lost in the woods. (The colors you see here are not the final colors.) It took me about an hour to get the painting to this point, but I think the time was well spent, because those trees are really important to the whole composition. Reflections (Oil Bar Painting as of July 16, 2013), a photo by randubnick on Flickr. I worked on this oil bar painting again this morning. I am working from photos I took at Bradley Palmer State Park (posted here July 14). Painting the trees reflected in the water is going to be tricky. This morning I continued to work on basic placement and composition. I started added more color just so I can see where things are. Reflections (Oil Bar Painting as of July 15, 2013), a photo by randubnick on Flickr. This is an oil bar painting that I started today. This is going to be a landscape roughly based on a photo that I took last summer at Bradley Palmer State Park, a view of trees reflected in the water. (Yesterday I posted the reference photo here.) 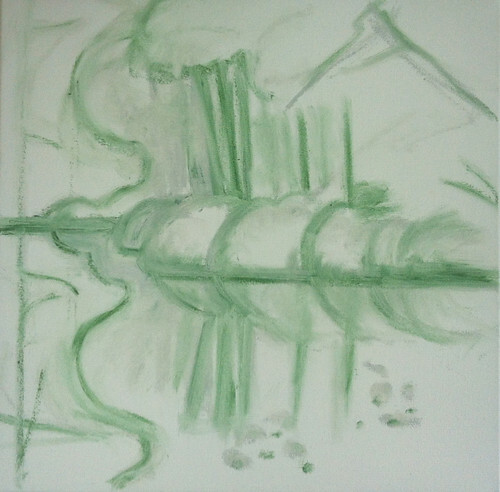 So far, what is on the canvas doesn't look like much, but this morning I worked out the composition, sketching with my oil bars, first gray, and then green. Although the reference photo posted here yesterday is cropped for a square format, I decided this morning that because that crop leaves out the trees in the foreground that frame the scene. Those trees are visible in the original photo (posted here August 25, 2012). So as I worked on the composition this morning, I made some little adjustments so I will be able to include those trees. To be continued. . . .
Reflections (Posterized with Square Format), a photo by randubnick on Flickr. My last painting is still drying on the easel, but I am getting ready to start another one. So today I looked through my photos and found what I was looking for, a picture that I took last year at Bradley Palmer State Park (Topsfield, MA). We had stopped at Willowdale Estates and found the boardwalk trail along the water. Although I have often been to Bradley Palmer State Park, this was my first view of that specific area. As I was taking the photo of the trees reflected in the quiet water, I thought I might want to paint the scene. The original version of the photograph is here August 25, 2012. This morning, I used Painter 12 to apply posterizing to the photo (to make shapes easier to see) and then, because my canvas is square, I cropped the image to get a square format. I think this is going to be a real challenge to paint, but that is good for me. This is the image that I will use as a reference photo, and I hope to get started tomorrow or the day following. 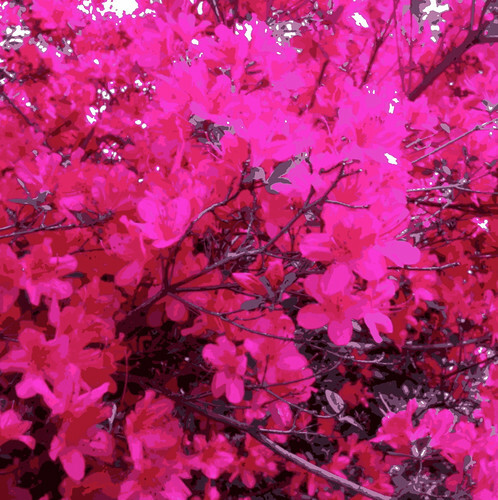 Azaleas in May (Digital Woodcut), a photo by randubnick on Flickr. I am still catching up with editing photos that I took in late spring. Tonight I created this image from another photo taken May 27 at Long Hill Gardens, here in Beverly, MA. I used iPhoto to do some basic editing, and used Painter 12 to create a digital woodcut. Red Azaleas at Long Hill, a photo by randubnick on Flickr. I am between paintings at the moment, so I thought I would catch up on editing recent photos tonight. This is a photo that I took with my iPhone camera during an afternoon walk at Long Hill Gardens back on May 27. 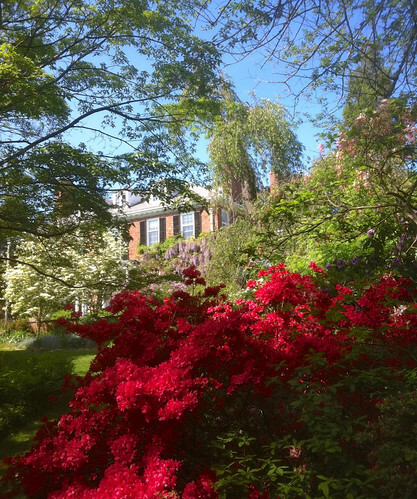 Everything seemed to be blooming at once, but those red azaleas stole the show. The house in the distance was once a private residence but is now owned by the Trustees of the Reservation. Tonight I used iPhoto to lighten the shadows, and then cropped the original photo to get this composition. Sunlight and Stormclouds (Oil Bar Painting), a photo by randubnick on Flickr. Here is the oil bar painting I have been working on. 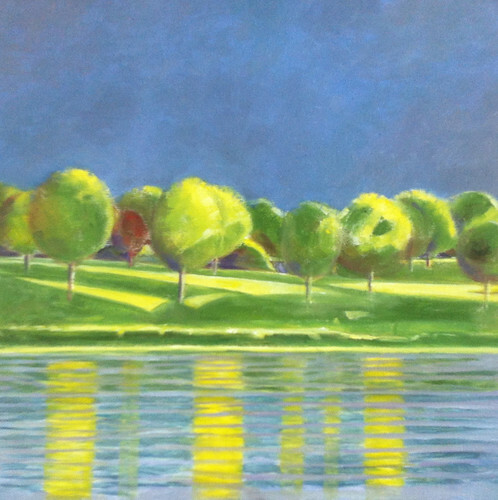 This is loosely based on a photo that I took in June, looking toward Salem from Obear Park. It was around sunset and a storm had just passed. (That photo is posted here June 19.) This morning I worked some more on the water, breaking up some of the lines of the ripples, but leaving the structure intact. I also added more surface reflections to the water. This sounds easy but I worked on this for quite a while, and kept going back to it through the day, making tiny changes. I am sure that I will keep on finding things to fix, but at this point, I believe those changes would be very minor. So I am calling it. This painting is finished. * Tomorrow I will start to seal the edges (paint the edges of the canvas). It is time to move on. * I reserve the right to change my mind. Sunlight and Storm Clouds (Oil Bar Painting as of July 9, 2013), a photo by randubnick on Flickr. This is my oil bar painting in progress, a view of Salem on a stormy summer. This is based on a photo that I took last month from Obear Park, here in Beverly, MA. I didn't work on this painting on July 8, not just because I was busy but because I thought the painting was pretty close to finished. I decided that I was wrong about that, and I did work on it yesterday. This is how the painting looked when my painting session was over. I had noticed that one of the long yellow reflections in the water was not straight, so I decided to fix it. I had also decided that the water needed more work, especially in the foreground. I am not going for photorealism here, but I do want to bring the painting a bit closer to the reference photo (posted here June 19). I am pretty happy with the painting so far, so it is getting a little scarier to change things because I don't want to lose what is already there (and that is easy to do). So yesterday, as I had my morning coffee, I studied the reference photo, especially the water. I looked at the photo right-side-up, and then I turned it upside-down and studied it some more. Then I began to paint. I straightened out the reflection, and then concentrating on the water in the foreground. I added to the streaks of light on the water, and began to break up the long horizontal lines in the water, to add to the perspective and to make the water look a bit more realistic. I added some short strokes to suggest movement in the water. I think I am on the right track and plan to do a little more. I also changed the foliage of one of the trees to eliminate a bit of confusion. Life was crazy today and I couldn't paint (July 10), so today's post is the latest version. But I plan to paint tomorrow. Sunlight and Storm Clouds (Oil Bar Painting as of July 7, 2013), a photo by randubnick on Flickr. Here is my oil bar painting in progress as it looked two days ago (July 7, 2013). 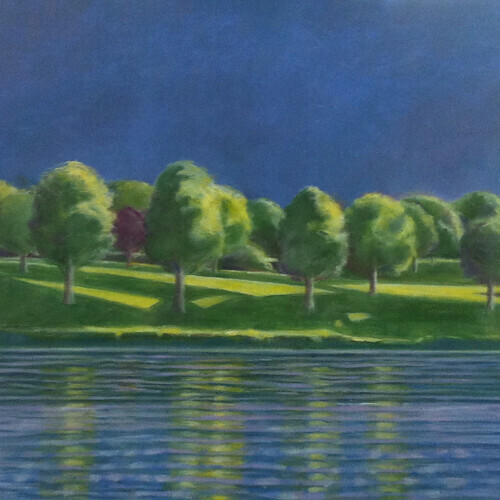 This painting is loosely based on a photo that I took from Obear Park here in Beverly, MA, of evening sunlight and storm clouds over Salem, just across the water. (The photo is posted on this site, June 19, 2013). 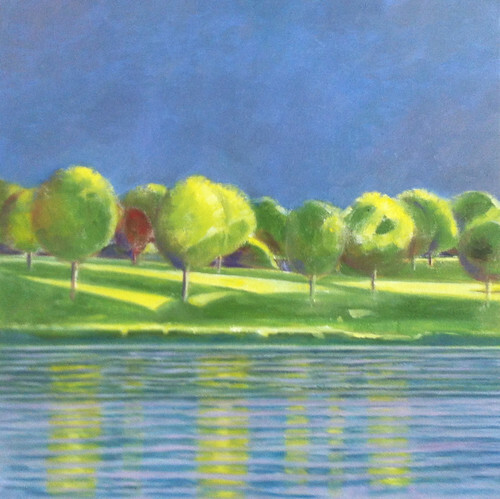 After I posted the July 6th version of this painting, I realized that some of the main trees were not squared up, but were leaning slightly to the right. So on July 7th, I set out to fix that. I used a straight edge and painted white lines down the middle of the problematic trees, and then re-painted the tree trunks and tree tops to solve the problem. While I was at it, I also adjusted the placement and height of the trees, making the tree closest to the water a bit taller. This made the perspective a bit easier to understand and also created a central focus for the picture. The added bonus was that when I adjusted the bottom part of the tree trunks, all the diagonal lines of the patches of sunlight in the grass began to line up. So in the end, the painting got better because I had to fix those damned tilting trees. It's hard to do, but I try to be grateful for the mistakes I make when I am painting, because, as one of my favorite painting teachers pointed out, mistakes present you with problems to solve, and that is how you learn. (Thank you Robert Daigle, wherever you are.) Still more to do, though. To be continued. . . .
Sunlight and Storm Clouds (Oil Bar Painting as of July 6), a photo by randubnick on Flickr. This is my oil bar painting as it looked on July 6th. 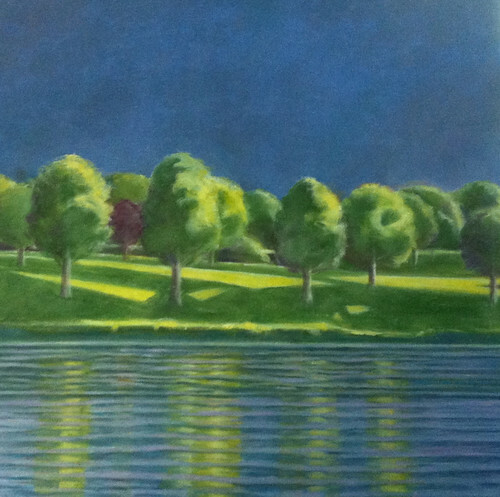 It is loosely based on one of my photos (posted here June 19) taken from Obear Park, looked at Salem, across the water. 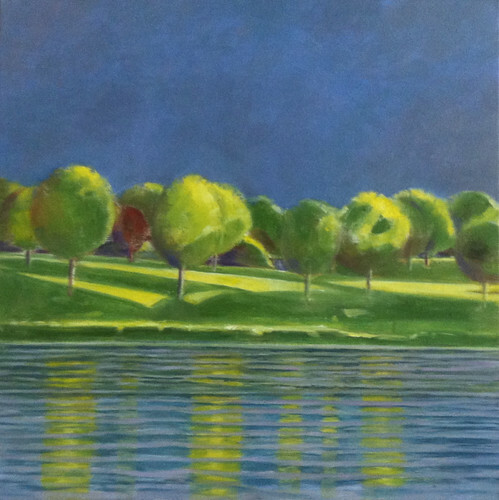 After I worked on the trees, I realized that the streaks of reflected light in the water seemed to be in the wrong place. I studied the reference photo and concluded that the reflections are of the tall trees that are the most brightly lit. So what I needed to do was to line them up with the tree trunks of those trees. I had already spent a lot of time painting that water, but it needed to be done, so that is what I did. I started by putting in the brightest streaks of light and worked from there, trying to avoid losing what I already had as I made changes. It took a couple of hours, but I think it was worth it. And I was pretty happy about the painting, until I noticed that the trees were listing gently to the right! So I would need to fix that too. To be continued. . . .
Sunlight and Storm Clouds (Oil Bar Painting as of July 5, 2013), a photo by randubnick on Flickr. Here is the oil bar painting I have been working on as it looked on July 5, 2013. I am using one of my photos as a reference, a picture I took in June at Obear Park here in Beverly, MA, (posted here June 19). The light was so beautiful and strange (which is why I took the photo). It was just before sunset (the "golden hour") and there were stormclouds over Salem, across the water. Capturing that light in a painting is quite a challenge. 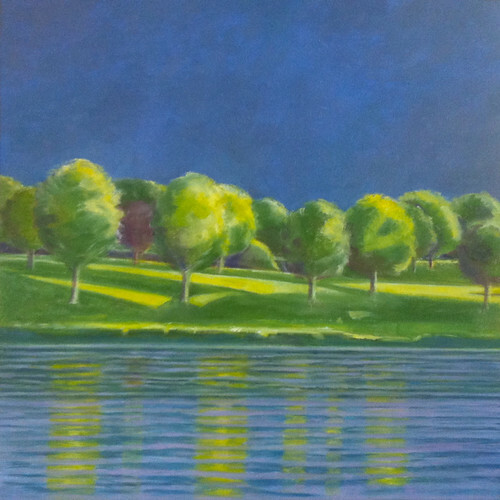 On July 5, I did more work on the trees, adding shadows, and trying to show that the sunlight was hitting some of the trees from the side, and the trees seen from across the water (the back) were mostly in shadow, as if back-lit. So I struggled with that problem while I painted. I painted for an hour and was pretty happy when I was finished. But then I realized that the streaks of reflected light in the water would need a bit of an adjustment. To be continued. . . .
Sunlight and Storm Clouds (Oil Bar Painting as of July 4, 2013), a photo by randubnick on Flickr. This is the oil bar painting I have been working on as it looked on Thursday, July 4. This landscape is based on a photo that I took from Obear Park, here in Beverly MA (posted here June 19). This is a view looking across the water towards Salem, with storm clouds in the distance just before sundown. So Thursday, after painting the water for several days, I started working on the trees again. Up to that point, the trees didn't have much definition, and were basically placeholders, as I concentrated mainly on placement and light. So I needed to go back and revise the shape of the trees, adding definition and getting away from the look of "lollypop" trees. This is how the painting looked when I had finished. 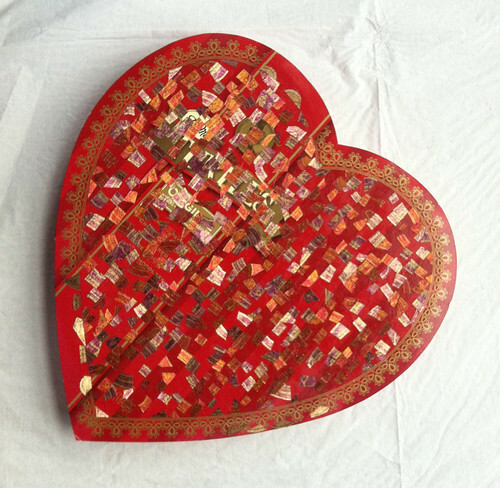 More to do. . . .
Another Heart Shaped Box as of July 3, 2013, a photo by randubnick on Flickr. Sunlight and Storm Clouds (Oil Bar Painting as of July 3, 2013), a photo by randubnick on Flickr. Here is the oil bar painting I have been working on as it looked yesterday, July 3, 2013. I am using one of my photos as a references, a picture that I took from Obear Park in the evening with storm clouds over Salem (across the river). (The photo is posted here June 19.) Yesterday was my third and final day of obsessively working on getting the water right. 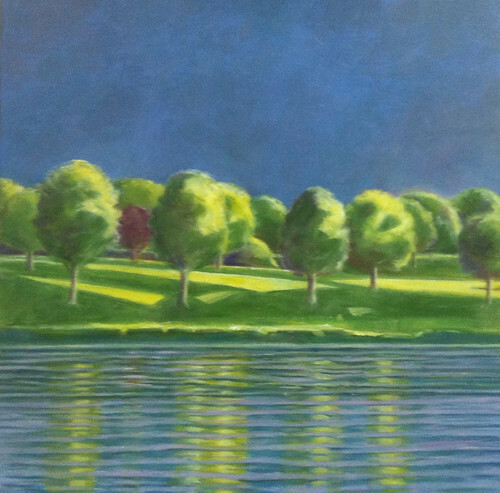 I was struggling to create that dark green horizontal band, a reflection of the shoreline. It occurred to me that it might help if I made the shoreline the same color, and it helped. Anyway, that is quite enough with the water. Time to work on the trees. To be continued. Sunlight and Storm Clouds (Oil Bar Painting as of July 2, 2013), a photo by randubnick on Flickr. This is my oil bar painting in progress as it looked yesterday. This landscape showing sunlight and storm clouds is based on a photo that I took recently from Obear Park here in Beverly, MA. It was near sunset and there were dark clouds over Salem, just across the river. (The photo is posted here on June 19.) 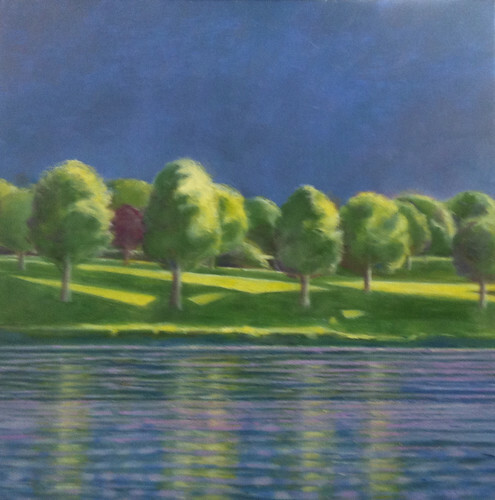 Yesterday I continued to work on the water, trying to get the effect of a dark band of green (reflected land) and streaks of purple (reflected sky). There are things I want to change about the trees and grass, but I want to get this water right first. To be continued. . . .
Sunlight and Storm Clouds (Oil Bar Painting as of July 1, 2013), a photo by randubnick on Flickr. Here is the oil bar painting I have been working on as it looked when I finished painting yesterday (July 1). 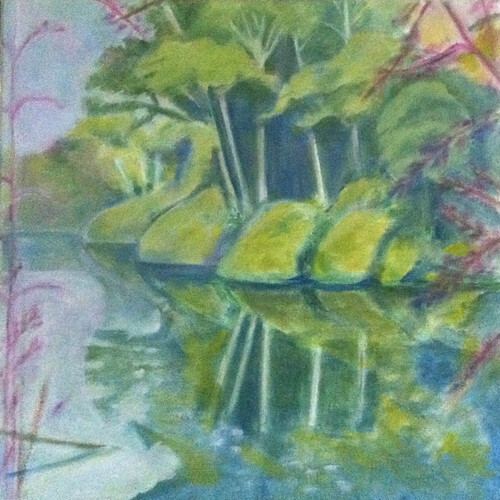 I am trying to paint a scene that I photographed recently from Obear Park, here in Beverly, MA. (My photo is posted here June 19.) It was nearly sunset when I took the photo and the long rays of the setting sun combined with distant storm clouds to create some unusual lighting on the opposite shore (which is Salem). Yesterday I continued to work on painting the water, which is a big challenge for me. I worked on making the reflection of the shore show up as a dark green horizontal band in the water. 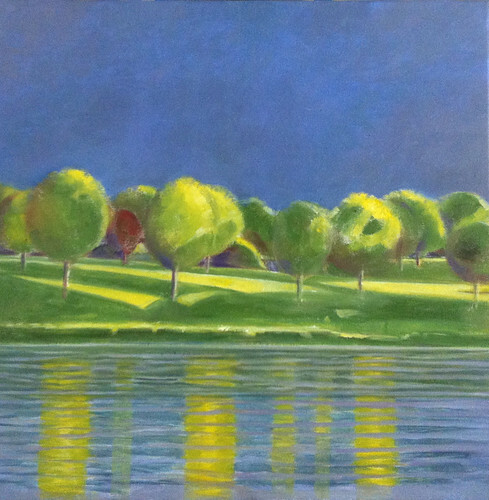 I also used some yellow-green to make the yellow reflections blend in with the surrounding water. Progress, but still more to do. To be continued. . . .
Sunlight and Storm Clouds (Oil Bar Painting as of June 30, 2013), a photo by randubnick on Flickr. This is my oil bar painting (work in progress) as it looked yesterday. This landscape is roughly based on a photo that I took recently at Obear Park here in Beverly, MA. (If you want to see the reference photo, it is posted here June 19.) Yesterday I began to add more color to the water, and I really struggled to figure out what the colors should be. After a lot of trial and error, I came up with dark green for the water close to the land (reflected shore) and teal green for the rest of the water. (I mixed dark green with periwinkle to come up with the color). 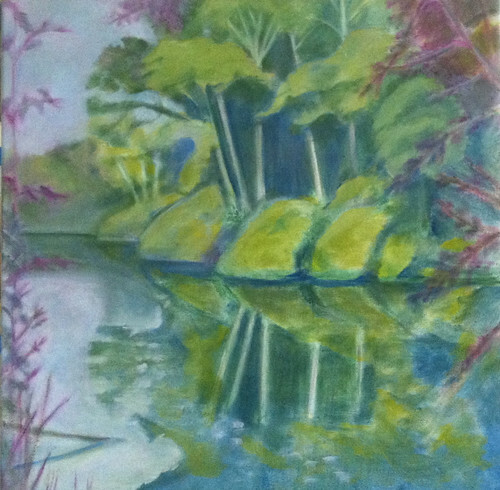 I am using periwinkle for the reflections of the sky on the surface of the water. This is all very complicated and I have gotten lost in this more than once! Painting water is very hard for me. At one point, I realized I was losing the yellow streaks in the water, so I used a straightedge to find the lines again. I worked for over an hour and stopped here because I got it to a point where I was happy with it so far. But there is more to do: the green band of reflected shore is not showing up well and the yellow streaks of light are far too bright and need to be integrated with the rest of the water. To be continued. . . .